The 1960s. Watts. The section of our long overlooked and underprivileged South Central Los Angeles community that, just a few years prior, blazed itself into the national TV and newspaper headlines with days of a racial uprising called The Watts Riots. I was in the college prep program at a Catholic all boys school called Verbum Dei High School. Not a large school. But it was a good school, one that still stands today. Verbum Dei didn't have the big budget for fine arts that schools in the white neighborhoods at that time had. So, our faculty took advantage of group rate tickets to see prestigious films in the Hollywood area as weekday field trips. This was fine by me. My fascination with films was in full bloom by the time I was 8. The films we saw were always big screen adaptations of classic works we studied in English Lit. class -- ROMEO AND JULIET, A MAN FOR ALL SEASONS, FAR FROM THE MADDING CROWD. There was another film that we students got on the bus to go see. The book was not on our required reading list but it was in our school library. This foreign film was at least seven hours long. In its theatrical release, you had to buy a ticket to see the first half one week and then return the following week to see the second half. I was glued to every single minute of the film. I have since seen it more than once. 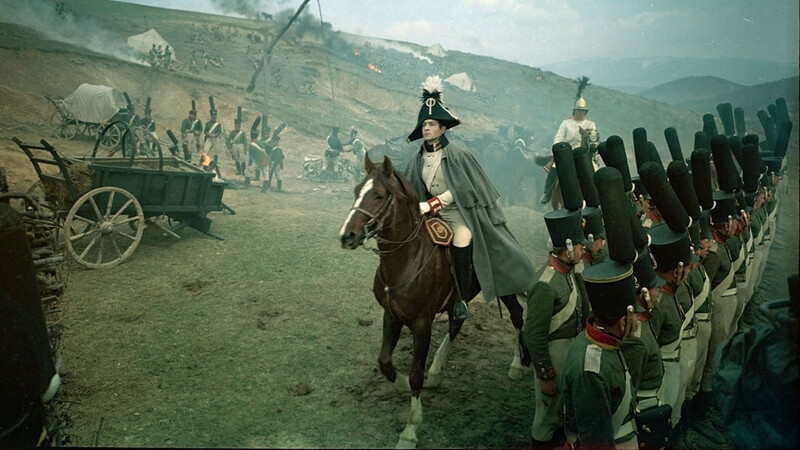 The movie is the 1960s epic Russian production of Tolstoy's WAR AND PEACE. It hit the U.S. in 1968. I'm so glad it did. For as long and as epic in its scope as the film is, director, co-writer and actor Sergei Bondarchuk gave it a quality that connected to working class senses. Let's face it. We were a high school class of predominantly Black and Mexican-American teen males. There was only one white guy in the entire student body and he came from a family that was scuffling to get by like ours were. We were the kind of guys that would be ripe for Uncle Sam to pick and ship for duty in Vietnam. WAR AND PEACE spoke to us. The news gave grossly inaccurate overall images of us black people in South Central L.A. as it covered the Watts Riots. Newsreels, still shown on movie screens in those days, filmed the devastation but never mentioned what triggered the uprising. The Los Angeles Times didn't even have one black reporter on its entire staff. From some of the local and network TV news coverage, you would never have guessed that South Central L.A. had black residents who were college educated, employed, had good books by celebrated authors in their homes and frequently went to see new movies, domestic and foreign. Residents like my parents -- and we lived in the curfew area during the Watts Riots. Especially after I saw WAR AND PEACE, I came to the realization that film journalism in print and on TV inaccurate images of what the black community liked and didn't like. The press releases reported that, just like Hollywood's GONE WITH THE WIND Scarlett O'Hara casting, there was a search of well over a year for the right actress to play Natasha. The film opened to lots of entertainment news attention and did quite well with moviegoers. It won the Oscar for Best Foreign Film of 1968. Our high school class was told that, for our college prep program, attending the first half one week was required. If we did not want to see the last half the following week, we would not have to get on the bus for the field trip back to the Hollywood area. But a note for a parent or guardian would be necessary to get us excused. Only one guy in the class did not return for last half. Gary broke his ankle in football practice and his mom kept him home. The rest of us were eager to see the rest of the story. Some of my classmates got off that bus from Watts sporting Afros the size of radar dishes. The things is -- if a local TV news crew had been on Hollywood Blvd to ask pedestrians if they'd seen this new and exceptionally long WAR AND PEACE, the reporter probably would not have approached a bunch of black and Chicano teen males, some of whom looked like Colin Kaepernick with Afro fully blown. But the reporter could have. We would've had plenty to say. I remember how jubilant one teacher was when we saw WAR AND PEACE. Father Henry said that, maybe we wouldn't read the novel, but at least one of us would check it out in the school library and try a few pages. He was right. I was one of those who did. Also, all of us returned from the movie saying to each other, "THAT's why it's funny Rocky & Bullwinkle cartoons have two Russian characters named Boris & Natasha!" Boris and Natasha came from Tolstoy. 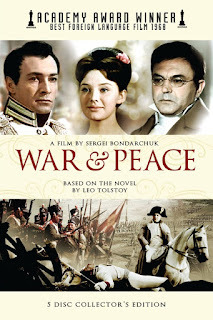 In the 1990s,while I was living and working in New York City, I found a DVD of WAR AND PEACE in my local video store. I rented it a couple of times. I had a great time watching it, but the print left something to be desired. 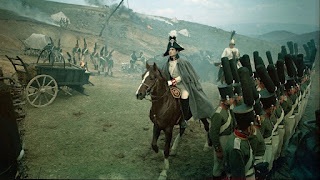 Some of the best news I read online last week is that Sergei Bondarchuk's WAR AND PEACE has been digitally restored and this extraordinary epic will be onscreen at New York City's Film Society Lincoln Center. It will play February 15 to 21. For more info, click onto this link: www.filmlinc.org. Also, give thanks to Janus Films and you can click onto its link here: www.janusfilms.com. I would love to see WAR AND PEACE on the big screen again in mint condition. To show you where America was culturally, WAR AND PEACE aired in prime time on ABC over four nights in 1972. Guess what? The ratings were good. That programming would not happen today. Tolstoy would be kicked to the curb in a heartbeat to make room for THE BACHELOR. Never underestimate the power of the fine arts. They can entertain, enlighten, change the images you have of people -- and they can be a bridge to other works of art. By the way, if you'd like to see the high school in South Central L.A. that I attended, just click onto this link: www.VerbumDei.us. 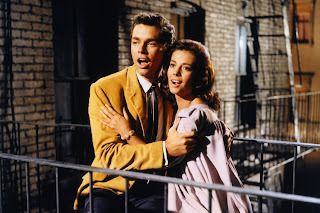 See classic films. Use and support your local libraries. Thanks for your attention.